Dislocation of the carpometacarpal joints is a very rare event and it is commonly linked with a high energy trauma . The cases in which the three central metacarpals are affected and present a volar dislocation are even fewer . Moreover, these might or might not be associated with Bennett's fracture . These injuries are often difficult to diagnose in emergency departments if a proper radiological study is not carried out . Dislocations of the carpometacarpal (CMC) joints often have subtle radiographic findings that may be overlooked in an acute setting and in the emergency room. Therefore, it is relevant to generate the appropriate views  to-allow for a quick diagnosis and treatment, thus reducing the risk of complications. Lateral and oblique views are important for the recognition of the true extent of the injury. Despite these facts, these kinds of injuries-commonly have good prognosis after the acute treatment, presenting a limited amount of complications. Early surgical intervention can lead to good functional results. Our case deals with a 33 years old male with no relevant medical background, who was admitted to the emergency department after a traffic accident. On his arrival, the patient was conscious and oriented, and presented a head trauma. He also presented a mechanism of direct contusion on his (non-dominant) right hand against the dashboard. 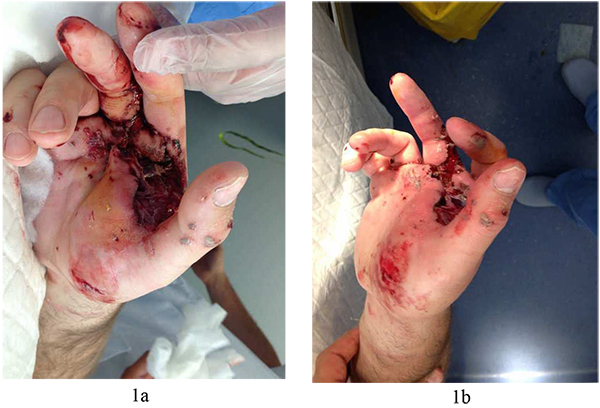 In the physical examination, pain and a functional impotence of the hand at 45º was identified, with the presence of a blunt laceration at a thenar level (Figs. 1a, b). Likewise, there was a large edema and swelling on the dorsal side of the hand. The distal vasculo-nervous structures remained intact. The diagnostic hypothesis was confirmed radiologically. This evidenced a radio volar dislocation on the second, third and fourth carpometacarpal joints, linked with a Bennett’s fracture of the first finger (Figs. 2a, b, c). After the initial treatment and cleaning of the injuries at the emergency department, the patient was taken to the operating room immediately. Fig. (1). Edema and swelling of the hand with the presence of an important laceration at a thenar level. Fig. (2). Postinjury radiographs (anteroposterior, lateral, and oblique views) showing volar and radial dislocation of the second, third, and fourth carpometacarpal joints. With the patient in supine position and under anesthesia, a thorough debridement of the wound was performed. The integrity of the superficial palmar arch and the rest of tendon structures present on that level were identified (Fig. 3a). Secondly, with the elbow extended, a traction of the three middle fingers was performed, pressing the base of the metacarpals from volar to dorsal. 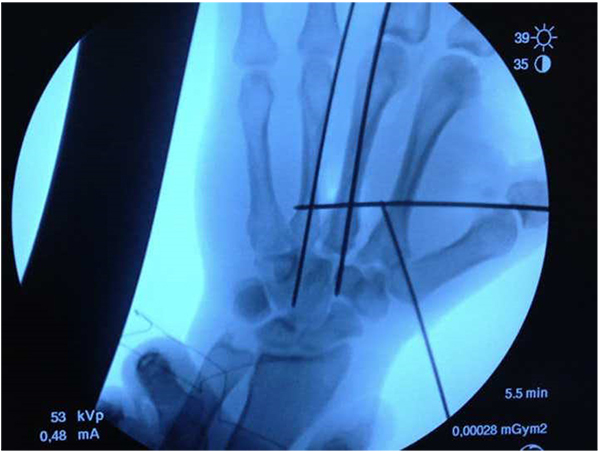 Under scopic control, the correct reduction of the metacarpals was checked before proceeding with the osteosynthesis through multiple 1.5 mm Kirschner wires percutaneously. Taking into account the instability, the first wire was fixed in an oblique direction from the base of the first to the second metacarpal, stabilizing the radial side. Afterwards, the other wires were also fixed: one transversally and two longitudinally, following the axis of the central metacarpals Fig. 3b. Fig. (3a). In this intra-operative image there can be seen the preservation of the superficial palmar arch of the hand which seems integral and uninjured. Fig. (3b). Radiological intra-operative image in which there can be seen the disposition of the Kirschner wires: one of them oblique from the base of the first to the second metacarpal, another transversally and two longitudinally following the axis of the central metacarpals. Fig. (3c). Post-operative radiographs showing the reduced second, third, and fourth carpometacarpal joints. The post-operative radiographs showed the reduced second, third, and fourth carpometacarpal joints stabilized with Kirschner wires (Fig. 3c). 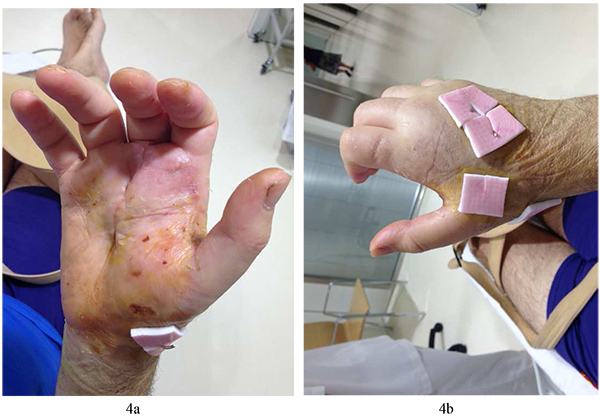 Daily treatment of the wounds and mobilization of the metacarpo-phalangeal joints was started the day after the operation to avoid a limitation of the mobility of the fingers secondary to prolonged immobilization. Six weeks later, the Kirschner wires were removed radiologically and the correct carpometacarpal stability was checked clinically. The wounds exhibited correct healing (Figs. 4a, b) and eight weeks later the patient was able to move his fingers without pain and with a strength comparable to that of the other hand. Literature on carpometacarpal joint dislocations is scarce, and the subject represents just <1% of all hand injuries . The first observations were described on the 19th century by Cooper & Roux . Masquelet et al. gathered 215 ases published in 1986, most of them being individual cases. The most numerous series are: 26 cases from Guimaraes et al. , 30 from Gerard et al. , and 31 from Gangloff et al. . Among the rare dislocations of the four last metacarpals, those of the fourth and fifth metacarpals are more frequent than those of the second and third metacarpals due to the higher range of mobility of the former. The coexistence of a distal carpal row fracture is quite frequent (26%) . The ligament and skeletal anatomy of the second through the fifth CMC joints has not been well described in the literature. Recognizing the inconsistent reports of the ligament anatomy, Nakamura et al. performed an extensive and decisive study of 80 cadaver wrists to delineate and describe the ligament anatomy of this area. The diagnosis of this kind of injury is not always easy due to the large edema found in the hand and the difficulty to properly see the carpometacarpal joints on radiographies. Swelling around the wrist with shortening of the knuckle should alert the clinician towards the possibility of such an injury. On routine anteroposterior view, overlapping of joint surfaces, loss of parallelism, and asymmetry at the carpometacarpal joints should raise suspicion of the possibility of a subtle carpometacarpal injury. It is essential to perform radiological projection in pure oblique and lateral positions in order to be able to diagnose these kinds of injuries . The treatment consists in the closed reduction when possible and fixation of Kirschner wires in cases of unstable injuries. When facing large open wounds or when it is impossible to reduce the dislocation in a closed way, it is necessary to resort to an open reduction. To the best of our knowledge, this is one of the few cases in which a volar dislocation of the three middle metacarpals linked with a Bennett’s fracture is described. The mechanism of injury in our case could have been a direct thrust over the knuckles that could have forced the metacarpals to rotate from the dorsal to the volar direction, causing dislocation of the middle three carpometacarpal joints and the Bennet’s fracture. Fig. (4). Evolution of the wounds on the fifth week aiming at correct healing and status of the wounds. It is a kind of injure which, when treated acutely through reduction and fixation of Kirschner wires, tends to have a very low percentage of complications . Among the main complications described in literature, cases of affected deep branch of the ulnar nerve , acute carpal tunnel syndrome  and avulsion of the extensor radial tendon of the carpus can be found. In cases that are diagnosed late, the most frequent complication is a significant reduction of the mobility and strength of the fingers. Therefore, it is important to perform all the necessary radiological projections so as to diagnose these kinds of injuries as early as possible and treat them in the most accurate way. Intensive postoperative physiotherapy is vital for achieving a satisfactory outcome . Kahlon IA, Karim A, Khan Z. Multiple carpometacarpal volar dislocation. J Coll Physicians Surg Pak 2011; 21(1): 49-51. Dreant N, Norat F, Péquignot JP, Lussiez B. Luxation carpométacarpienne antérieure des deuxième et troisième rayons. Chir Main 2007; 26(4-5): 235-7. Dillon JP, Laing AJ, Thakral R, Buckley JM, Mahalingam K. Volar dislocation of the index carpometacarpal joint in association with a Bennett’s fracture of the thumb: a rare injury pattern. Emerg Med J 2006; 23(3): e23. Fisher MR, Rogers LF, Hendrix RW. Systematic approach to identifying fourth and fifth carpometacarpal joint dislocations. AJR Am J Roentgenol 1983; 140(2): 319-24. Dobyns JH, Linscheid RL, Cooney WP III. Fractures and dislocations of the wrist and hand, then and now. J Hand Surg Am 1983; 8(5 Pt 2): 687-90. Ebelin M, Soubeyrand M, Idrissi R. Luxaciones carpometacarpianas. Encyclopédie médico chirurgicale – Aparato Locomotor 2010; 43(2): 1-11. Masquelet AC, Nordin JY, Savary L, Poulizac C. A propos d’un cas de luxation antérieure des quatre derniers métacarpiens. Ann Chir Main 1986; 5(1): 63-6. Guimaraes RM, Benaissa S, Moughabghab M, Dunaud JL. Les luxations carpométacarpiennes des doigts longs. À propos de 26 cas dont 20 cas revus. Rev Chir Orthop Repar Appar Mot 1996; 82: 598-607. Gerard F, Garbulo P, Tropet Y. 152 Vichard P. Les luxations carpométacarpiennes dorsales traumatiques des doigts longs. À propos de 30 cas. La Main 1998; 3: 23-32. Gangloff D, Mansat P, Gaston A, Apredoaei C, Rongières M. Les luxations carpométacarpiennes du cinquième rayon: étude descriptive à propos de 31 cas. Chir Main 2007; 26(4-5): 206-13. Garcia-Elias M, Bishop AT, Dobyns JH, Cooney WP, Linscheid RL. Transcarpal carpometacarpal dislocations, excluding the thumb. J Hand Surg Am 1990; 15(4): 531-40. Nakamura K. Pat terson RM, Viegas SF. The ligament and skeletal anatomy of the 2nd through 5th carpometacarpal joints and their adjacent anatomy. 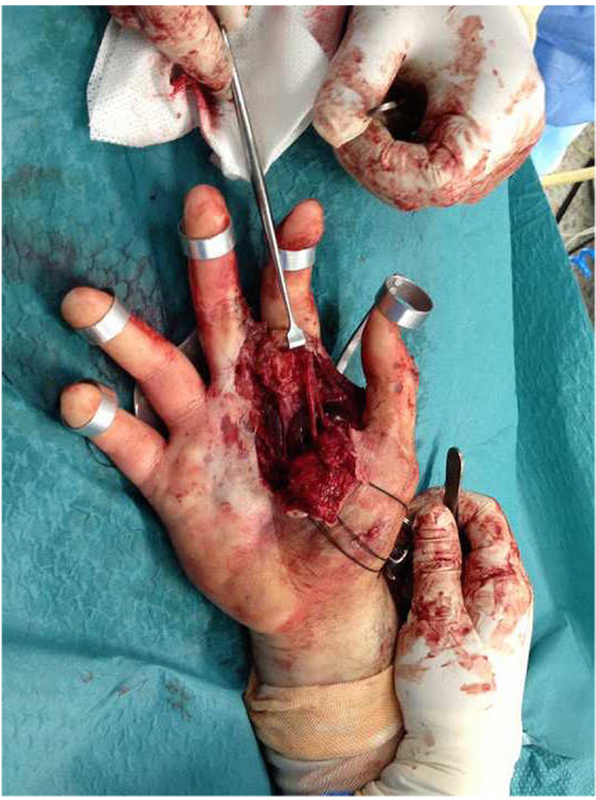 J Hand Surg [Br] 2001; 26: 1016-29. Tingart M, Bäthis H, Bouillon B, Tiling T. [Dorsal carpometacarpal dislocation of the fifth finger: Discussion of diagnosis and therapy on two cases]. Unfallchirurg 2000; 103(1): 76-80. Lawlis JF III, Gunther SF. Carpometacarpal dislocations. Long-term follow-up. J Bone Joint Surg Am 1991; 73(1): 52-9. 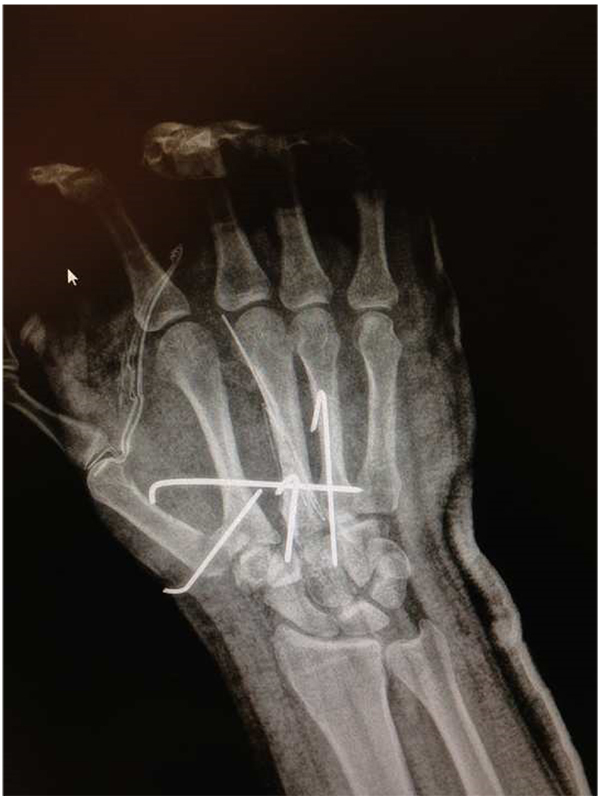 O’Rourke PJ, Quinlan W. Fracture dislocation of the fifth metacarpal resulting in compression of the deep branch of the ulnar nerve. J Hand Surg [Br] 1993; 18(2): 190-1. Weiland AJ, Lister GD, Villarreal-Rios A. Volar fracture dislocations of the second and third carpometacarpal joints associated with acute carpal tunnel syndrome. J Trauma 1976; 16(08): 672-5. 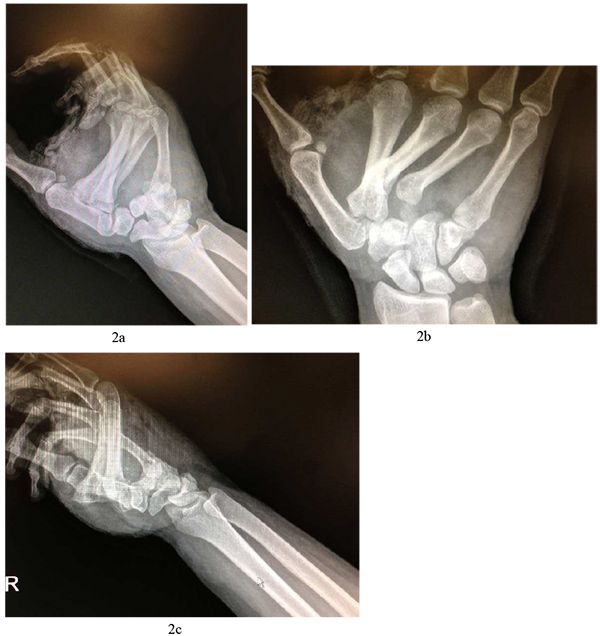 Bell T, Chinchalkar SJ, Faber K. Postoperative management of carpometacarpal joint fracture dislocation of the hand: A case report. Can J Plast Surg 2010; 18(3): e37-40.